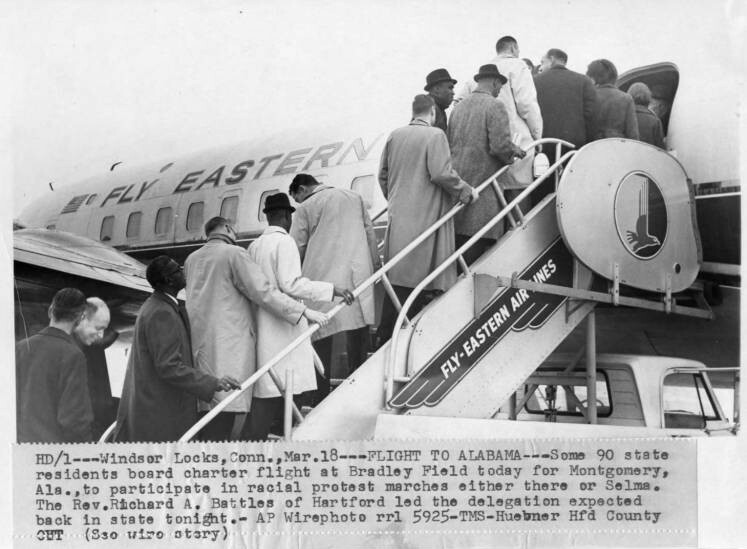 On March 18, 1965, about 90 Connecticut residents boarded a chartered plane at Bradley Airport to participate in the Civil Rights protest marches, led by Dr. Martin Luther King Jr. over voter registration rights in Alabama. The group was headed by Reverend Richard Battles of Mt. Olive Baptist Church, Hartford. National outrage at the police violence used in blocking marchers at the Edmund Pettus bridge on March 7, 1965, in Selma, Alabama, known as “Bloody Sunday,” eventually forced the passage of the Voting Rights Act.